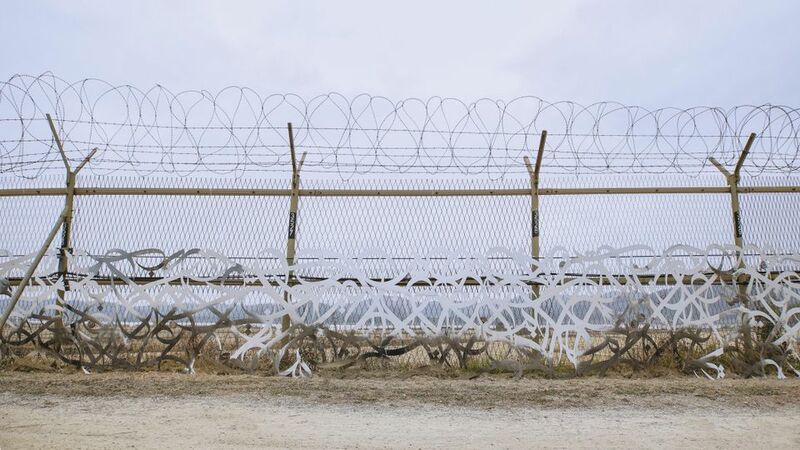 A large sculpture by the French-Tunisian artist eL Seed, installed along the security fences of the demilitarised zone (DMZ) that separates North and South Korea, is likely to remain unfinished now that the two countries have pledged an end to the state of war between them. “This is the first time I am happy that I have had to cancel a project,” the artist says. The work, called The Bridge (2017), was meant to be placed on barriers on both sides of the DMZ. The North Korean government approved the work but declined to pay for it, the artist says. Last November, eL Seed installed the first half of the sculpture in South Korea. But after the historic meeting in April between Moon Jae-In, the country’s president, and Kim Jong Un, his North Korean counterpart, the artist abandoned fundraising for the installation of the second part. The work, commissioned by the Gyeonggi Museum of Art in Ansan, South Korea, is made of 43 aluminium panels of Arabic calligraphy, translated from a Korean love poem. “The first idea that came into my head was of a bridge, because I always say that my artworks create bridges between people, countries and generations. This project was the perfect metaphor for my artistic practice,” eL Seed says. The artist’s initial proposal for a 20-metre-high sculptural “bridge” that went over the fence was rejected for security reasons and his plans to paint the work bright blue were ruled out on the grounds that it may stand out as a military target.